I have already written about why it doesn’t make sense to pay people to clean your solar panels. I also wrote it doesn’t make a lot of sense to clean them yourself. Once you add in the value of your time, the chance of falling off the roof and killing yourself, and how cleaning panels usually only adds a couple of percent to their average output, it is not really worth it. But this article isn’t written for people who want to make economic sense. It is written for people who take pride in having a well maintained system that will squeeze every last drop of energy from the sun. It is written for people who want to clean their own solar panels. So pay close attention while I cover the finer points of how to clean solar panels. There will be a test. The test will be administered by reality and will involve the entire planet trying to kill you. You don’t think I am serious about the entire planet trying to kill you? Well if you don’t pay attention to what I write about safety you might walk off your roof and do a reverse Newton. You know how Isaac Newton got smarter when something landed on his head? Well, trust me, the opposite happens when you land on your head. The best time to clean your panels is when they’re dirty. That information is probably not a huge surprise to you. Maybe you’re thinking I could have skipped this step and gone on to something a bit more useful. But a lot of people do their cleaning to a schedule, like clockwork. And like some forms of clockwork, I think these people are cuckoo. If your panels aren’t dirty it’s a waste of effort. Even worse, cleaning panels can scratch them and reduce their efficiency. So unnecessary cleaning can achieve the opposite of what you are trying to accomplish. Moderate to heavy rain does an excellent job of cleaning solar panels. Panels angled at 10 degrees or more will let rain will flow down them and wash them clean and most Australian roofs slope at 15 degrees or more. Unless conditions are particularly dusty, if you clean your panels within a couple of months of decent rain you are probably wasting your time. If you can only monitor the total output of your system then you may be able to use it to guess when they might benefit from a clean. But it is very hard to tell as wind and air temperature will affect how hot the panels are and cause output to vary. The easiest solution is often to just look at the solar panels. If you can see them from the ground, this is pretty damn easy. And if you need a ladder to see them, well that’s obviously a bit more damn difficult. If your panels look spick and span they don’t need cleaning. And if they are hard to spot under the mounds of bird droppings, then they could probably benefit from a wash.
At this point, before anyone touches a solar panel, to avoid accusations of being, “completely irresponsible” I am supposed to inform you to contact your solar panel manufacturer and follow their instructions for cleaning them. In addition, you should always wear a helmet when driving a car, just in case. And only ever drive Volvos. But don’t drive Volvos powered by petrol, diesel, or any kind of flammable substance. Because that would be dangerous and we wouldn’t want to take any risks now, would we? On the internet you can find advice about cleaning solar panels. One gem is to never use brushes, mops, or cloths on your solar panels. And this is why my preferred method of cleaning solar panels is telekinesis. But if you neglected your Jedi training and are unable to use the force, then using a soft broom or cloth may be tempting. This is not an unreasonable choice. But it will scratch the panels. No matter how clean and soft the material you use is, at some point you will get some tiny bits of grit in it, possibly too small to even see, that will scratch the glass. This is why some people follow a strict liquids only rule. Personally, I agree with this rule. Mainly because I am lazy and using a soft broom or a cloth sounds suspiciously like physical activity to me. That said, careful use of soft brushes and cloths isn’t going to cause any significant damage. Any time you move a brush or a cloth against a solar panel you run the risk of scratching it. But provided you are careful this is likely to be insignificant. Ten years ago panels cost over one thousand dollars each and so people were paranoid about doing anything that could harm them. But gentle use of a soft brush a couple of times a year isn’t likely to do much harm. And even if after a couple of decades you do eventually end up reducing their output by half a percent that is not going to add a lot your electricity bills. Personally, I say just clean your panels from a distance with sprayed water since that’s the safest option. But if you are going to use a brush, then I suggest getting a soft broom and only use it for cleaning solar panels. Store it brush up so it won’t collect grit from the ground that can scratch your panels. Another bit of advice you may have heard is to not spray water on solar panels when they are hot. I agree with this advice. Solar panels are tough so I very much doubt that spraying a hose on a hot one would cause it to crack or shatter, but I’m guessing you’d feel pretty stupid if you managed to prove me wrong, so it’s probably best not to try. Washing panels early in the morning, when it is overcast, or any time there is not a large difference between the temperature of the panel and the water you are using will avoid this possibility. While you probably wouldn’t break your panels through thermal shock, using cold water on hot panels will cause them to go through a thermal cycle. This is when it contracts due to cooling and then expands when it warms up again. This puts the joins between components that expand and contract at different rates under strain and is a major cause of the slow deterioration in output solar panels suffer over the years. While the deterioration in performance from one rapid thermal cycle would be extremely small for any well made panel, such as those that are tier 1, it still doesn’t do it any good. Professional solar panel cleaners often make a big deal about how they use purified water to clean panels. They say it will stop evaporating water leaving mineral salts behind and give a better clean. This is certainly true. Using distilled or demineralised water will prevent streaking and make the panels cleaner. But they will be cleaner by an insignificant amount. If you don’t wash your panels when they’re hot, which you shouldn’t, then most of the water is just going to run off them. The residue left behind by evaporating tap water is not good, but it only has a tiny effect on performance. Maybe only as much as one or two days dust falling on the panels. After cleaning your panels you can rinse them with distilled water if you like. But it won’t make much of a difference. 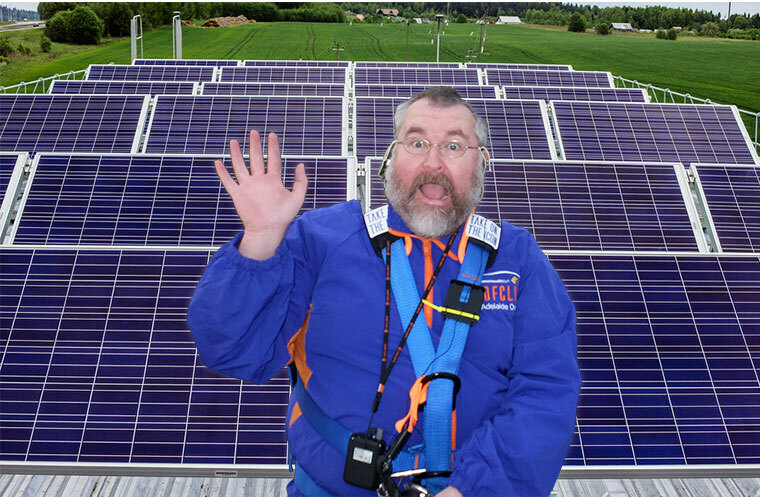 The most important thing when cleaning solar panels is safety. Because if you don’t have safety, what do you have? I’ll tell you what – Danger! And danger is cool! Have you ever seen a cool person cleaning solar panels? I don’t think so. This means if you want to get your panels clean, you must avoid danger at all costs. You can download the Safe Work Australia guide to fall prevention here. Their rules on proper ladder use are extensive. If you are going to work on the roof they suggest putting up safety railings. If that’s not practical they recommend using properly installed and maintained safety harnesses. I know that most of you aren’t going to follow these precautions and I understand why. Those of us who weren’t brought up with modern safety standards have a tendency to laugh in the face of death. Unfortunately, we also have a tendency to fall off roofs and land on our heads. So please, if you are using a ladder or going up on your roof, think carefully about how to do it safely. The best way to avoid falling off a ladder or roof is to stay on the ground. I highly recommend this approach. If you can see the panels on a single story building then you can almost certainly spray them with a hose. This is the easiest and the safest way to clean your panels. Bird poo is a problem for solar panels. With string inverters a single bird poop can not only lower the performance of the panel it lands on, but the other unsullied panels on a string. And most systems in Australia use string inverters. Fortunately, even if you don’t clean your panels, bird poop is not a permanent problem. Rain will remove it. If you don’t believe me, go outside and look at your roof. Is it covered in a layer of bird poop? Probably not. This is because rain that is heavy enough washes it away. If you have tree branches overhanging your roof, then yes, there may be a layer of bird poo. If they overhang your solar system, then you could have a major poo problem (as well as a major shade problem). Just water pressure from a hose removes bird poo, provided you are patient. The trick is to hose the panel down and then come back 5-10 minutes later after the water has had a chance to soften the poop and spray it again. If it doesn’t come off give it another 5-10 minutes and try again. By this point all or most of it should be gone. If you can physically reach your solar panels you can put a wet cloth over the bird poo and let it soak for a while. After about 10 minutes the bird poo should be ready to come off with just a little water pressure and no need for rubbing which can cause scratches. Water alone gets most grime off panels, but using mild detergent is fine. Dish washing detergent will do, but greatly dilute it before use. While concentrated detergent shouldn’t do much damage to glass it may not all wash away and the residue of the product used to clean your panels will make them dirty. Always thoroughly rinse solar panels after using dish washing detergent. This is because it contains salt that will contribute to corrosion if allowed to stay on panels. Particularly if they aren’t corrosion resistant. There are cleaning products for spraying on glass and then washing off and they should be okay to use. But avoid any products that require rubbing with a cloth. They can cause scratching and require a lot of work for very little gain. If the gutter below your solar panels leads to a water tank, then anything you wash off those panels will end up in it. This includes detergent. If you would rather not have soap suds in your water tank then only use water to clean your panels. If you don’t like the idea of washing dust and bird poop into your water tank, don’t feel bad. The rain washes it in there anyway when you’re not looking. There are solar panel sprays that claim to help panels clean themselves, but I don’t find them convincing. I have an advertisement in front of me for one that contains more lies than my first two marriages. Their product may work just fine. But there is no way I am going to trust a company with less credibility than a paper submarine. I say stay away from these products. At least until they prove large scale solar farms fixated on the bottom line actually use them. And also make sure the price is low enough to make it worthwhile. And then tell them to go jump anyway. This article is for people who want to clean solar panels, not let some magical elixir do it. Because it may only improve average output by a couple of percent, cleaning solar panels isn’t really worth the effort if it requires you to do anything more than spray them with a hose from the ground. So I don’t recommend climbing up ladders or clambering on roofs to clean them. It is simply not worth the risk. But if you insist on striving to reach great heights, such as those at the top of a ladder or on a roof, please be careful and try not to lose an argument with gravity.